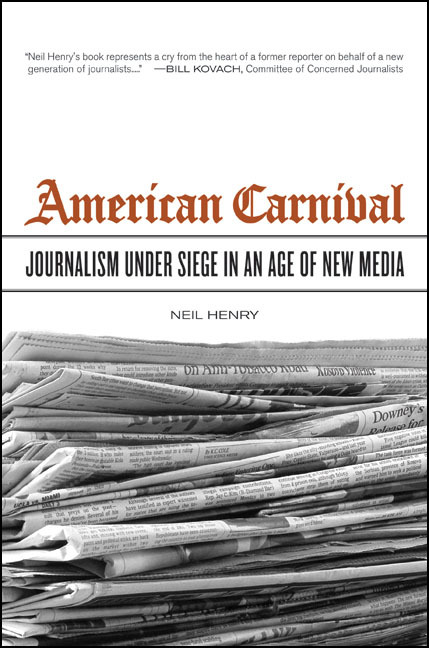 In this vividly written, compelling narrative, award-winning journalist Neil Henry confronts the crisis facing professional journalism in this era of rapid technological transformation. American Carnival combines elements of memoir with extensive media research to explore critical contemporary issues ranging from reporting on the Iraq War, to American race relations, to the exploitation of the image of journalism by advertisers and politicians. Drawing on significant currents in U.S. media and social history, Henry argues that, given the amount of fraud in many institutions in American life today, the decline of journalistic professionalism sparked by the economic challenge of New Media poses especially serious implications for democracy. As increasingly alarming stories surface about unethical practices, American Carnival makes a stirring case for journalism as a calling that is vital to a free society, a profession that is more necessary than ever in a digital age marked by startling assaults on the cultural primacy of truth. A former correspondent for the Washington Post, Neil Henry is Associate Professor in the Graduate School of Journalism at the University of California, Berkeley. He is the author of a racial history, Pearl's Secret (UC Press).